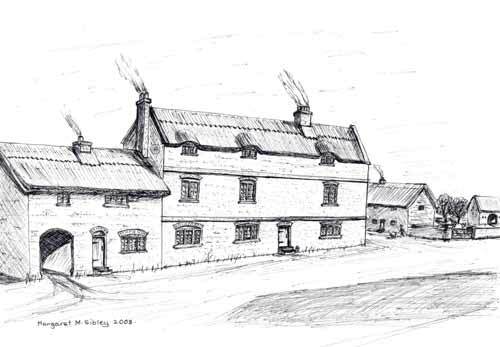 The drawing shows how the house might have looked around the early 1700s. It belonged to the Needham family, and was excluded from the sale to the developers of Market Street. Similar houses in the district suggest the position of the single door; symmetry was unimportant in such buildings before the Georgian era. The top floor windows may or may not have had the thatch ‘eyebrow’ arrangement. The attached cottage with cart entrance is a view of how the present post office building could have looked if it was there! It is shown as a farm worker’s cottage. The present house gives every appearance of being 18th century or earlier. It is built of narrow brick. The former steep pitch of the roof (the newer brickwork providing the newer more gentle pitch can be easily seen) and the end parapets almost certainly indicate it would originally have been thatched. The curious circle in brick high on the west gable wall may be a bull’s-eye which was a popular decorative device of the late seventeenth and early eighteenth centuries with no apparent function. The roof seems to have been raised to give more headroom in the second storey, possibly previously attic, rooms. The two plat bands - the string courses standing proud of the front wall - indicate that the original house did have three floors (or perhaps two and a half storeys), as these features usually delineated one floor from another. There are many examples of single and some double plat bands in other villages and towns around Bingham (notably Newark, Screveton and Bulcote. The house at Screveton is built of a similar brick has a date plaque for 1702). The central chimney is indicative of a house from before 1760. The first building in Market Street adjoining the post office house would appear to have been built soon afterwards, possibly as a virtually contemporaneous extension to it. The house was sold to Joseph Dodsley Oliver who in the early 1800s was a tanner and wine and spirits merchant. This led later in the nineteenth century to more wines and spirits dealers and eventually to the house becoming the Vaults Hotel, It remained thus until becoming the post office in 1936.